An absolutely stunningly upgraded and lovingly renovated apartment that offers chic beach cottage finishes throughout. Light, bright and airy. Johann and Petra have used this apartment as their beach cottage get-away for the past 3.5 years. 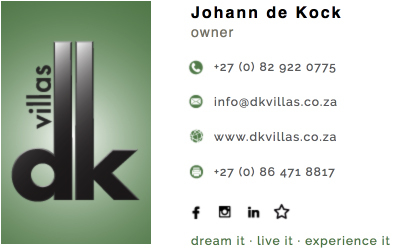 They have recently updated it and added it to their DK Villas portfolio. So it's full of family history and stories – and now Johann and Petra invite you to add your “stoepstories” (Stoep is an Afrikaans word that just cannot be translated - a great spot for lekker chats, boerewors braais . . . a veranda or patio in front of your house) to this idyllic beach cottage. The apartment offers a wealth of natural light and the sound of the sea throughout the open plan, double volume living and kitchen space. The apartment is designed for a laid-back weekend or holiday. Brunch on the balcony or afternoon braai watching the sunset over the ocean. It’s a photographer's dream, those sunsets! The long white sandy beach and beautiful Atlantic Ocean are perfect for lazy days and long walks. It is in the most beautiful "floral-area" and bird lovers will find a wealth of birding sites, as well as the whale watching in the months of June to September, as the Southern Right whales pass the coastline…..perfect for tourists to just relax… and allow the soul to unwind. This beach cottage offers 2 bedrooms with queen size beds, one open plan en-suite bathroom with bath, and a separate guest bathroom with shower. Luxury Egyptian cotton bedding and towels are provided. DSTV is included as well as free Wi-Fi available throughout the unit. There is a garage with direct access to the apartment. A washing machine and tumble dryer are also located in the garage, as a separate laundry facility. The complex has a dedicated washing line area. There are plenty of additional secure visitor parking bays as well. • An enclosed balcony, with magnificent sea views, a built-in braai, a dining room table that seats 6, folding stacking windows to maximise the enjoyment of the views and the amazing weather! At the time of making your booking, a 50% deposit is required to secure the booking. The balance of the payment is required prior to arrival. A R2000 key and breakage deposit is payable either on arrival, or with full payment and is refundable within 5 - 7 working days after the apartment has been scrutinised and all found in order.